We are well and truly in the placement season and some top business schools already have over 20% of their batch placed! However, there is simmering tension between the companies and the placement committees across many schools during the processes this year. The point of contention – CAT Percentiles. A company recently threatened to walk out of a campus unless they were given access to each candidate’s CAT Percentiles. Many Placement Committees have created a policy to NOT disclose CAT percentiles. In fact, there is a penalty on a candidate if he/she reveals his/her CAT Percentile in an interview! Companies are hell bent on knowing CAT Percentiles after their experience last year. So, why do Business Schools (or rather Placement Committees) not allow revelation of CAT Percentiles? The controversy around reservations raises its ugly head once again. Most companies still respect the CAT percentile as a barometer (remember that senior executives in companies are all paper pencil CAT takers of the older era). They want to interview the best. As the batch sizes have gone up with the implementation of the new reservation norms, it is not unlikely to find candidates with 60 odd percentile even in the older IIMs. A lot of companies just refuse to interview such candidates. Preferred recruiters that visit the campuses earlier than the rest do not face this problem. They should believe that they have access to the best talent. However, even some of these recruiters are a little paranoid about CAT Percentiles. It is the companies that come a little later (when 35-40% of the batch is placed) who desperately want to know more about the pool of candidates they are interviewing. 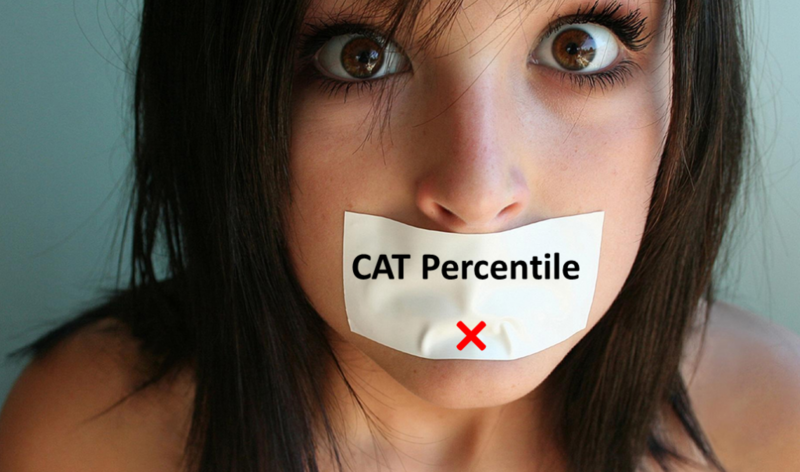 If CAT Percentiles are revealed, some students are unlikely to get any shortlists at all. And in Indian business schools, ensuring that 100% placements happen in record time is more important rather than ensuring that both companies and candidates are happy at the end of the process. Placement committees will go to any extent to ensure 100% placements. This results in a standoff. – Why can’t Business Schools just be transparent? Are we asking for privileged information? – How can you dictate who we should recruit? If we feel CAT Percentile is a criteria for shortlisting, we will use it. It is a fully justifiable metric of shortlisting people. Also, it is just one of the metrics. We look at other aspects as well. – There is no obligation on us to recruit unplaced candidates in your school. We recruit those who fit our profile best and show maximum potential. That potential is a function of past record and we consider CAT Percentile as an important indicator of that past record. – Are you saying that we should not consider CAT seriously which is what you use to admit students in the first place?! – We need to ensure everyone is placed. For that, we need to increase everyone’s chances of getting shortlisted. Revealing CAT Percentiles will ensure some candidates will hardly ever be shortlisted for interviews. – There are so many other indicators on a person’s resume. Previous Academic performance has strong correlation to CAT performance. Why can’t they use that? – In order to increase diversity in their workforce, they are willing to overlook CAT Percentiles for women. Why can’t the same logic be used elsewhere? Is it possible for Business Schools to make writing of CAT Percentiles optional in their resumes? Some schools (including a couple of older IIMs) allow that. Those with a spectacular score can use it to their advantage and those who don’t want to talk about it can try and present their resume by highlighting other points. Why can’t Business Schools do away with the resume format? Why is it necessary that the format of everyone’s resume look the same? This will allow everyone to highlight the best things about themselves rather than submit their resume in a drab and boring format used currently. Focus on CAT Percentiles will be replaced by curiosity to know more about the individual irrespective of which category that person has gained admission. 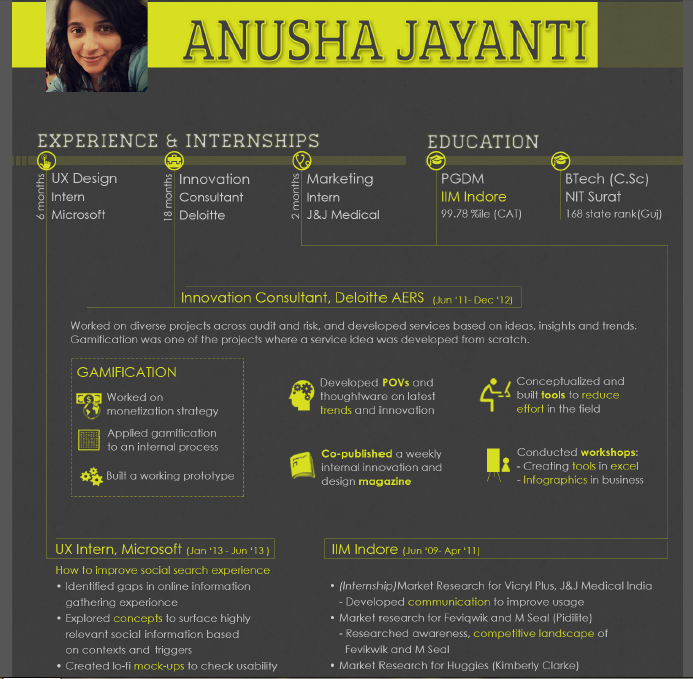 This is an abridged version of a resume created by Anusha Jayanti. We thank her for letting us use it! Business Schools face a huge reputation risk with policies like these. Companies appreciate transparency. In many ways, this problem is a reflection of a deeper issue with the philosophy of ensuring everyone gets placed as fast possible without any concern for career choices or what companies require. The other problem is that companies do not really believe that business schools add enough value anymore. They mainly recruit students very early during summer placements : 2-3 months after joining a business school and expect students to come through since they have good aptitude. This aptitude is tested by the CAT and the selection criteria of the IIMs. This is the reason why they also feel that students who get admission under various categories at lower percentiles will not really improve much beyond a point in 2 years of a business school. And hence, the obsession with CAT Percentiles and the reluctance to hire during final placements. “Students graduating from the IIMs back in 2005-06 were better prepared for the corporate world. They had gone through the rigour. Getting admission in an IIM wasn’t easy nor was getting a good grade. These days we can’t get anything done from them unless these guys are put through elaborate training programmes. My experience over the last 2 years has been disappointing.” says a Mumbai based banker from a MNC bank who takes personal interest in hiring. He has been visiting campuses for the last 10 years.